A range of tastey desserts packed with protein to satisfy your sugar craving, enjoy and keep your diet clean (and your conscience)! Muscle Mousse dessert is a high protein, gluten free dessert mousse that can be enjoyed at any time of the day, especially before bed. 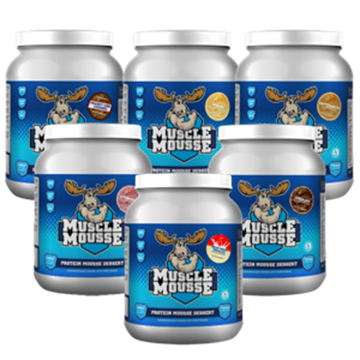 Muscle Mousse® dessert mousse mixes with water in a regular shaker bottle in seconds and sets in minutes to form a tasty, real mousse dessert pudding.